A golden 1, 2 or 3 is set on a vertical plaque decorated with a swoosh effect frame and three embossed bronze stars. This plaque stands on a small circular plinth with space for adding a personalised plate. 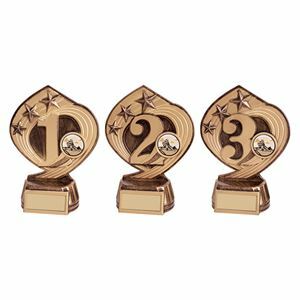 The Slipstream 1st, 2nd and 3rd Place Plastic Award is made from a quality, premium grade plastic and lacquered with an antique golden glaze for a glossy finish. 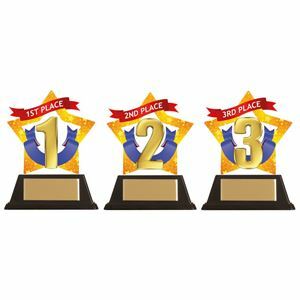 A great value trophy for awarding multiple placed contestants. 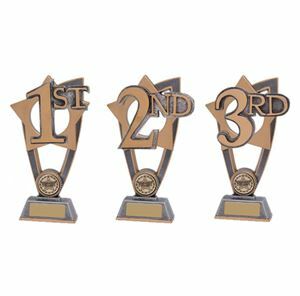 A great little trophy for awarding to your first, second and third placed contestants, this flexible plaque offers outstanding value for money. The Mini-Star 1st, 2nd and 3rd Place Acrylic Plaque has been formed from a quality acrylic and expertly cut into a star shape. UV printed with a high definition, full colour image of a large golden 1, 2 or 3, the number is flanked by a bright blue ribbon and surrounded by a gold star frame. A red banner across the top announces the position in white text. This award comes in two parts, the black base simply and neatly clicking together with the plaque to create this stylish trophy. Excellent Value. 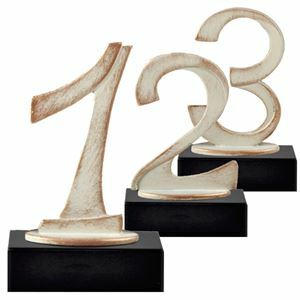 Cast in a striking contemporary design, the Blaze 1st, 2nd & 3rd Place Trophy displays a star struck 1, 2 and 3 numerals which are respectively set in a shiny gold, silver and bronze fan. The die-cast fans are set, in sharp contrast, in front of the gunmetal grey trophy. The award is made from a premium plastic and mounted on a small moulded base which can be personalised with a FREE engraving text plate. 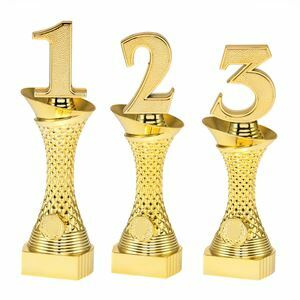 In gleaming gold, the Bulk Purchase - Imperial Gold 1st, 2nd & 3rd Place Trophy displays a bold gold "1", "2" or "3" on a stylish torch shaped stem base which has a beaded texture design. The award is cast from premium plastic which has been developed to be weightier for a quality feel and finished in a shiny gold glaze. The trophies are in size order with 1st place being the largest at 275mm. Great value. 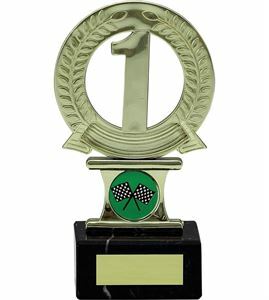 The 1st, 2nd & 3rd Place Laurel Trophy is a high quality glazed plastic trophy standing on a heavyweight black marble base. The simple circular shaped centrepiece features a laurel styled design on a circular surround with the numbers 1, 2 or 3 in the centre of gold, silver or bronze laurel frames. The 1st, 2nd & 3rd Place Laurel Trophy has space for a printed logo insert to be added, ensuring suitability to any sport, event or presentation. Representing excellent value for money the Euphoria 1st, 2nd and 3rd Place Achievement Award is the smallest sized award in the Euphoria range. 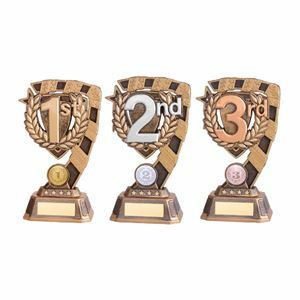 Made from high quality bronze coloured resin, this superbly versatile trophy can be customised to suit any event and is a perfect way to recognise your 1st, 2nd and 3rd place positions. The trophy showcases a shield, partly surrounded by a decorative gold striped frame, displaying a choice of 1, 2 or 3, each number coming in a different metallic finish. The Euphoria 1st, 2nd and 3rd Place Achievement Award is a premium bronze resin trophy coated in a high shine glaze. Standing tall on a striped two sided angled frame, the trophy displays a shield depicting a golden laurel leaf wreath surrounding a large number 1, 2 or 3 in the centre. The numbers are finished in different colours; gold for 1st, silver for 2nd and bronze for 3rd. 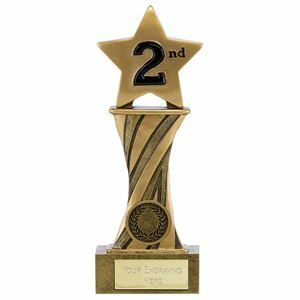 This attractive trophy comes mounted on a small plinth and would make an ideal award for your next presentation. These beautiful, elegantly designed awards feature a metallic 1st, 2nd or 3rd motif, displayed on a round hollow frame. The vortex effect frame of the Sonic Boom 1st, 2nd and 3rd Place Achievement Award is decorated with cutout stars and sweeping golden panels. The numbers displayed on the motif are coated in different colours; gold for 1st , silver for 2nd and bronze for 3rd place, each surrounded by a laurel wreath. The trophy is made from a high grade plastic and glazed for a high sheen finish.